Being the first of what I hope will be many many more “Pack for a Purpose travelers” to Curacao, the 56th country on our website, was a special privilege! 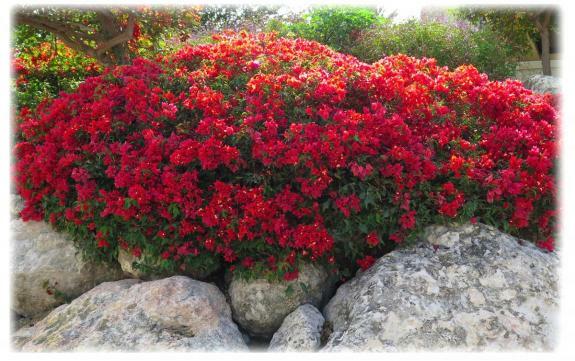 We arrived April 2 at the Santa Barbara Beach and Golf Resort to sunshine, warm breezes and welcoming hospitality. The resort has a strong commitment to projects in their local community. As the most important part of our trip, my husband and I were able to visit two of the three community projects the resort is supporting. 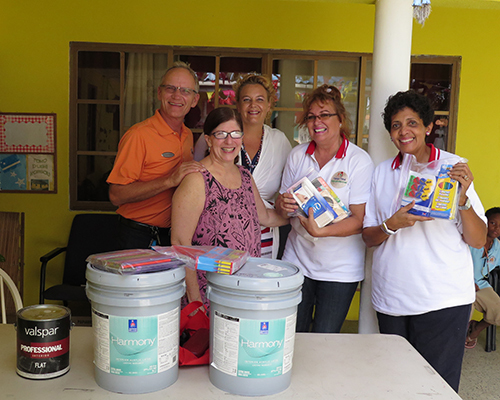 We were impressed by the difference the resort is making in the lives of the children in Curacao, and we were delighted to be able to deliver the supplies we brought for the projects. 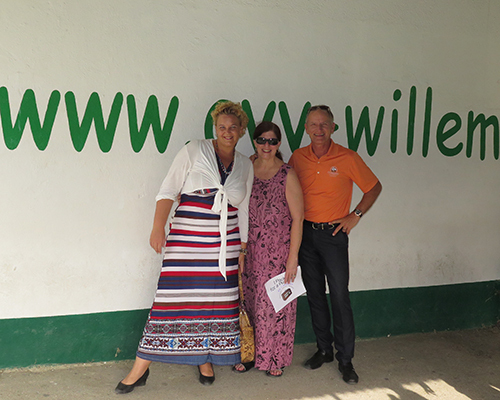 On April 3, Philippe Eversdijk the General Manager and Ilona Faas de Bruijne the Sales Coordinator personally picked us up from our room and drove us to the first community project which is an after school program serving 110 children. We arrived with supplies from the requested needs list. In addition, the resort provided several gallons of paint as we were informed paint is always a useful commodity in Curacao. Emma Eman – Bradshaw, the founder and director has created a remarkably effective free resource for the children in her community. She has created a safe place in her home for the children to play and study after school. 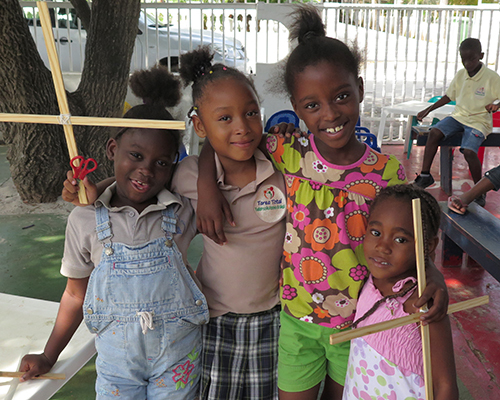 The children receive a nutritious meal daily, tutoring by community volunteers, and participate in a wide assortment of arts and crafts activities. 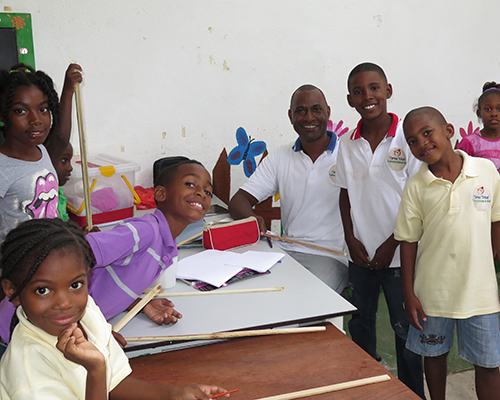 During our visit, the children were making kites as April is the traditional month of flying kites in Curacao. It was immediately apparent that the children were in a loving and supportive environment. The positive interactions between the children and the staff were heartwarming and made our time there extremely enjoyable. 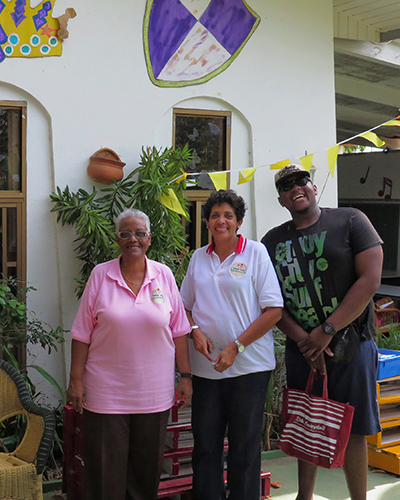 Joy and laughter echoed on the breeze and enthusiasm filled the spaces inside and out during our visit. 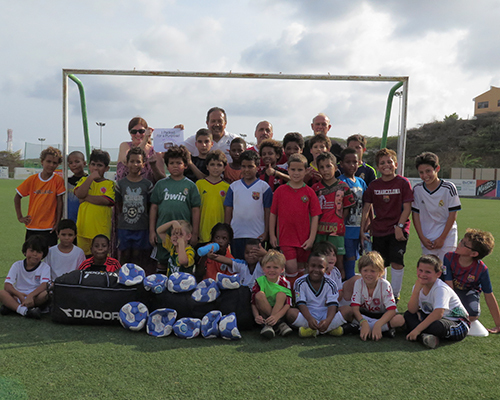 Next we were off to the soccer school on Curacao where we delivered 95 pounds of soccer balls and uniforms which had been graciously supplied by the vice president of SOCCER.COM, Brendan Moylan, through the US Soccer Foundation’s Passback Program. Brendan Moylan had heard my interview on NPR’s Here & Now. He then requested Mike Thomas, who works with him on behalf of Passback, to get in touch with me to discuss how they could partner with Pack for a Purpose. Once Mike and I met and I informed him of the soccer project supported by the Santa Barbara Beach and Golf Resort on Curacao, he quickly offered to provide the two duffel bags full of requested supplies (which was all we could carry on the trip.) He delivered them to our home three days later. This was their first commitment to our partnership. When we arrived, Ronald Anes, the director of the Dutch Soccer School Curacao explained to us how the children’s soccer clubs work on the island and discussed his plan to share the supplies with the clubs which currently have the greatest need. We spent some time just enjoying watching the children playing soccer knowing the wonderful benefits children receive when they participate in group sports. The afternoon flew by filled with the joy of being able to provide the community, which was giving us so much pleasure, supplies that would be meaningful and useful to them. We are very grateful to the management and staff of the Santa Barbara Beach and Golf Resort for all of their assistance during our stay. Several times during our six day stay, different members of the staff approached us to share their ideas on how they could personally contribute to the three projects being supported by the resort. Clearly they had been thoroughly briefed on the resort’s commitment to the community projects and Pack for a Purpose. It was inspiring to hear the creative ways they were finding to participate and further enhance support of the projects. As the founder of Pack for a Purpose, it was thrilling to experience the depth of commitment of the Santa Barbara Beach and Golf Resort to the children of Curacao and to see firsthand the interaction between the management and the community projects. For Scott and I, “Packing for a Purpose” in Curacao made the trip we took go much farther than the miles we traveled!